Early white bush scallop squash is a variety of summer squash more familiarly known as pattypan squash. Taking their nickname from their scalloped edges, pattypan squash are white, yellow or light or dark green. Typically ranging from 1 to 4 inches in diameter, early white bush scallop squash have a mild, slightly sweet, buttery flavor, making them a versatile accompaniment to a wide variety of dishes. They are a good source of vitamins A and C, potassium and magnesium. 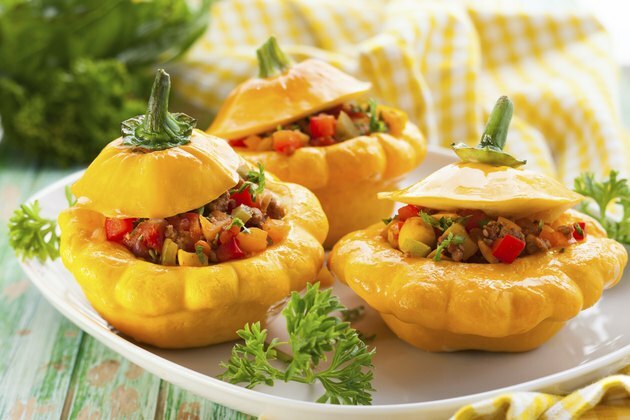 Pattypan squash are quick and easy to cook by baking, sauteing and boiling. Rinse the squash off under cool running water and dry it with paper towels. Cut off the top and bottom of the squash with a sharp, serrated knife, removing the stem and blossom areas. Turn the squash on its side and carefully cut downward to make 1/4-inch-thick slices. Lay squash slices flat on the bottom of a baking pan. Drizzle them with melted unsalted butter or a bit of olive or other vegetable oil, and sprinkle on salt to taste. Add any other seasonings you like, or according to the recipe you're preparing. Place another layer of slices over the first, repeating as needed. Cover the baking pan and bake the squash for about half an hour, until tender. Keep in mind that cooking time differs by oven, quantity of squash and size of the slices. Wash and cut the early white bush scallop squash into 1/4-inch slices. Discard the topmost and bottommost slice. Preheat 3 tbsp. of unsalted butter or 2 tbsp. olive or other vegetable oil in a large skillet over medium-high heat. Lay the squash slices flat in the pan and add salt and other seasonings. Reduce the heat to medium. Saute the squash for 4 minutes, then flip the slices with a spatula or tongs. Saute the other side for another 4 minutes, and remove the squash once it's tender crisp. Clean the pattypan squash and use a serrated knife to cut it into 1/4-inch slices width-wise. Throw away the top and bottom slices. Fill a large saucepan about halfway with cold water. Lightly salt the water and bring it to a boil over high heat. Add the squash slices to the water, turn the heat down to medium and bring the water to a boil again. Cover the saucepan and boil the squash until it's tender crisp, which should take about 10 minutes.